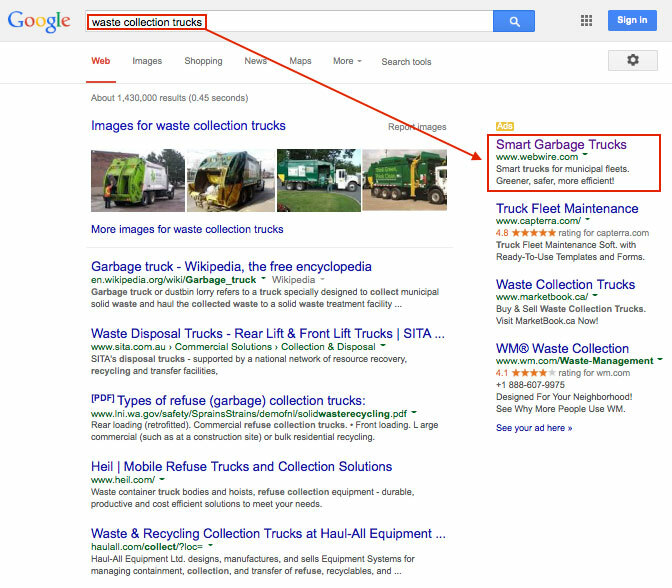 Managed Pay Per Click Into Google Search Results. Unique to WebWire, have your news integrated into a campaign within Google search results. Integration into a Google Pay Per Click (PPC) campaign. Includes Google Search results placement and content network. Derived from keywords and phrases entered during submission. Includes your keyword matrix and WebWire's management. Accommodates unlimited search result displays within a four month campaign, or 150 “click-throughs,” whichever comes first. How Do WebPost® PPC Keywords Work? This is how we configure the keywords and phrases you provide us with during the submission process (words and phrases that drive Internet searchers to your release). Search Phrases for "Little Green Men"
To enter just "Little" or "Green" or "Men" on their own as search options would yield a very broad search, and would place your release at the bottom of a very large search result. Keywords must pertain to your your news, and WebWire editorial staff may add keywords or phrases in an effort to increase the visibility of your WebPostPPC campaign and Google must approve unique words, such as proper names and company names. Get your news within Google Search, and associated advertising networks, as a sponsored link within a professionally managed Google Pay Per Click (PPC) campaign. At just $199.95 USD, your business, organizational or personal news will be included within Google Search as a sponsored link driven by keywords you assign during the simple-to-use submission process. This service accommodates unlimited search result displays within a four month campaign, or 150 "click-throughs" (users actually clicking to view the entire news release), whichever comes first. Once approved by WebWire's editorial staff, WebPost® PPC submissions will be active within two business days (USA Eastern Time Zone). You will receive an email containing your keyword matrix, indicating that your campaign is online. Special efforts are taken by WebWire staff to keep campaigns viable for as long as possible. For example, if a submission emanates from Australia, then the campaign may be turned off during late night hours there; again, in an effort to bring about as much online exposure as possible. This program is the fastest way to get into Google Search and it is only offered by WebWire.